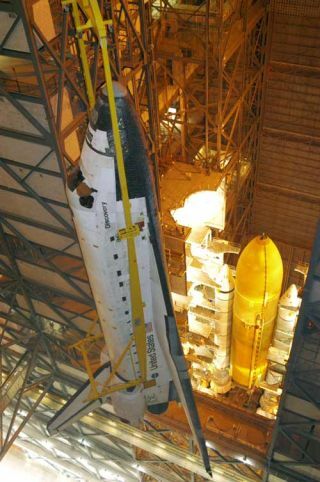 Suspended from an overhead crane in the Vehicle Assembly Building at NASA’s Kennedy Space Center, the orbiter Discovery is lowered toward the Solid Rocket Booster and External Tank (seen below) already stacked on the top of the Mobile Launcher Platform (MLP). CAPE CANAVERAL, Fla. -Kennedy Space Center workers are preparing this morning to outfit shuttleDiscovery with a new fuel tank. Discovery is resting this morning in the center aisle of the Vehicle AssemblyBuilding, awaiting a lift from a monstrous overhead crane. Crane workers will hoist Discovery into position to mount the spaceship to anew stack of external fuel tank and twin solid rocket boosters. The operation is expected to take most of the day once it begins. Discoveryremains scheduled to return to the launch pad in a week for a launch no earlierthan July 13. Discovery was brought back to the VAB to be mounted to a new tank, which hasbeen modified to solve issues related to ice debris and a problematic fuelvalve. Publishedunder license from FLORIDA TODAY. Copyright ? 2005 FLORIDA TODAY. No portion ofthis material may be reproduced in any way without the written consent of FLORIDA TODAY.